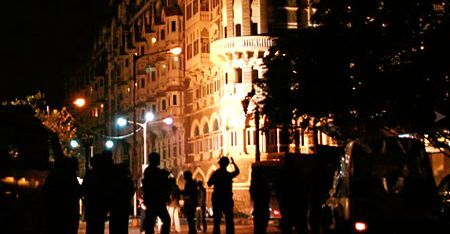 MUMBAI, India — The gunman captured in last month's Mumbai attacks told police he had originally intended to seize hostages and call the media to make demands, according to his confession statement obtained Saturday by The Associated Press. 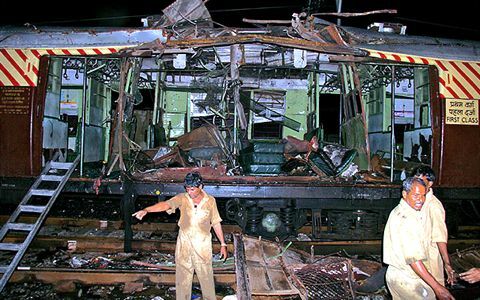 Mohammed Ajmal Kasab said he and his partner, who assaulted the city's main train station, had planned a rooftop standoff, but they couldn't find access to a roof, the statement said. The two killed dozens of people inside the station, but it's unclear if they ever held hostages. He said the assault, which started Nov. 26, was initially set for Sept. 27, though he doesn't explain why it was delayed. 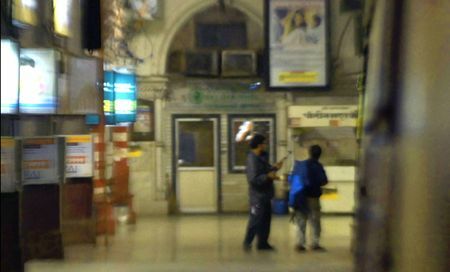 The gunmen had been told by their handlers to carry out the attacks during rush hours when the station is teeming with commuters. 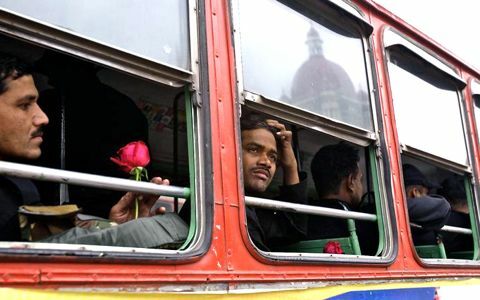 After reaching Mumbai, Kasab and his partner, Ismail Khan, the group's ringleader, headed to the train station by taxi. 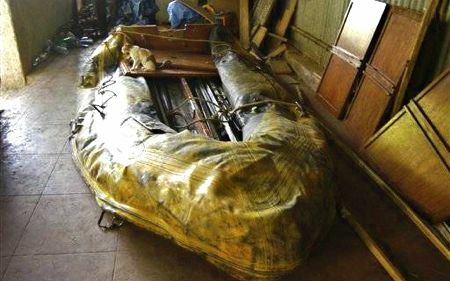 "Ismail and myself went to the common toilet, took out the weapons from our sacks, loaded them, came out of toilet and started firing indiscriminately toward the passengers," Kasab told police. 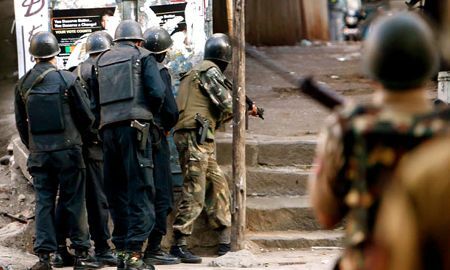 As a police officer opened fire, the two militants retaliated with grenades before entering another part of the station and randomly shooting more commuters. 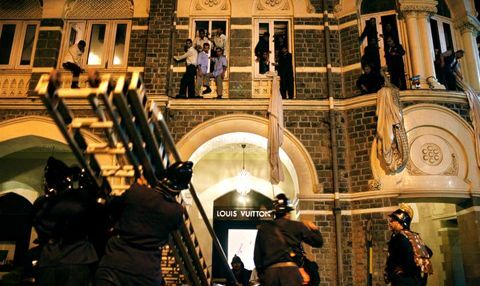 The men then searched for a building with a rooftop where they had been told to hold hostages and call a contact named Chacha, whom Kasab identified as Zaki-ur-Rehman Lakhvi, the suspected mastermind behind the attacks. Chacha, which means "uncle" in Hindi. Lakhvi would supply phone numbers for media outlets and specify what demands the two should make. 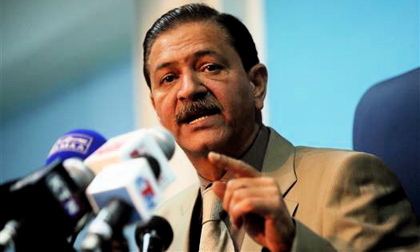 "This was the general strategy decided by our trainers," Kasab said. After failing to find a "suitable building," however, the two men instead stormed a hospital where they looked for hostages and exchanged more gunfire with police, he said. 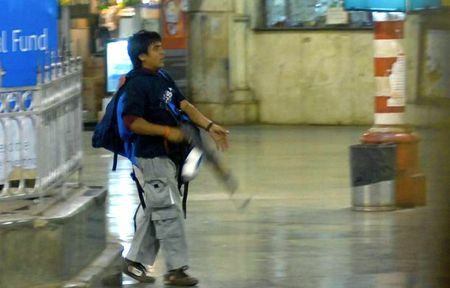 Kasab, 21, confirmed he was Pakistani national and said he was trained by Lashkar-e-Taiba, the terrorist group banned by Pakistan in 2002 and blamed by India in the attacks. He said he was given lectures on India security and intelligence agencies, as well as instruction in how to evade pursuing security forces. 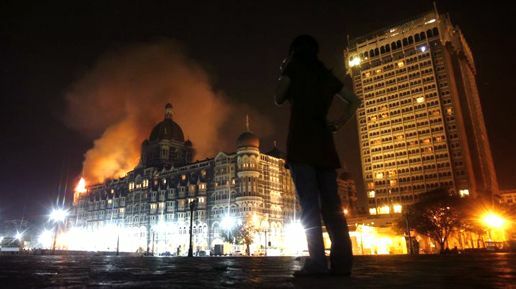 Police said Saturday that Kasab has also written to Pakistani officials to request legal help. 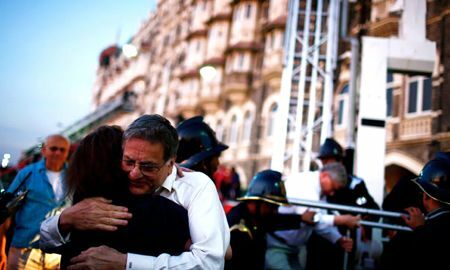 In a letter written Thursday, he asks for "legal aid" from the Pakistani consulate and to meet with a consular representative, said Rakesh Maria, Mumbai's chief investigator. The letter was forwarded to India's government to relay to Pakistani officials, but it was unclear whether it had been delivered, Maria said. Pakistani officials were not immediately available for comment. 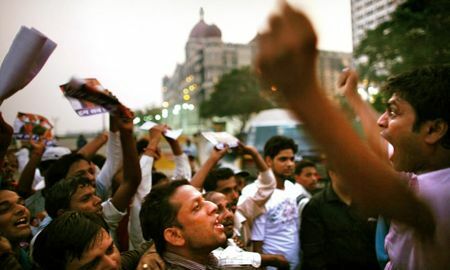 A number of Indian lawyers — including a prominent group of Mumbai attorneys — have refused to defend Kasab against criminal charges amid outrage over the attacks. 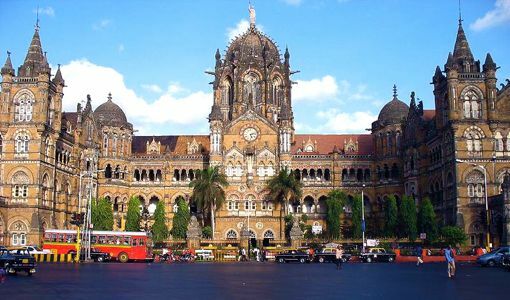 Kasab is being held on 12 offenses, including murder and waging war against the country, but has not yet been formally charged. 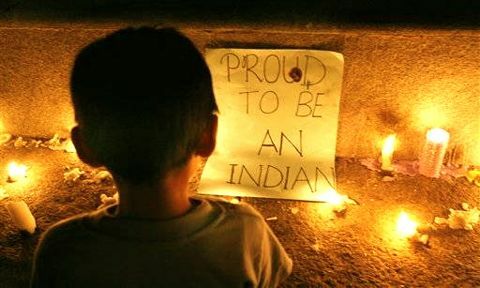 Islamabad has refused to acknowledge Kasab's nationality, complaining that India has yet to furnish any evidence. 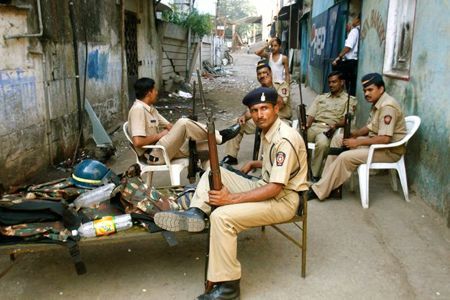 MUMBAI, India — The country's top law enforcement official has resigned amid criticism that the 10 gunmen appeared better coordinated and better armed than police in Mumbai. Mukherjee on Wednesday adopted a more strident tone against longtime rival Pakistan. 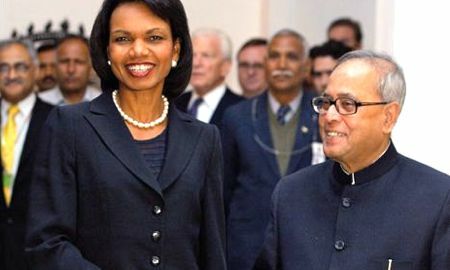 "There is no doubt the terrorist attacks in Mumbai were perpetrated by individuals who came from Pakistan and whose controllers are in Pakistan," Mukherjee said after a meeting with Rice. "The government of India is determined to act decisively to protect Indian territorial integrity and the right of our citizens to a peaceful life, with all the means at our disposal," he said, a turnaround from earlier statements that ruled out military action. 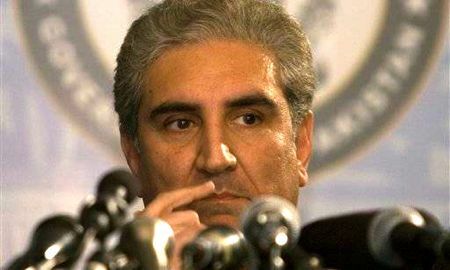 Rice urged Pakistan to act "transparently, urgently and fully," saying Islamabad has a "special responsibility" to cooperate with the investigation. 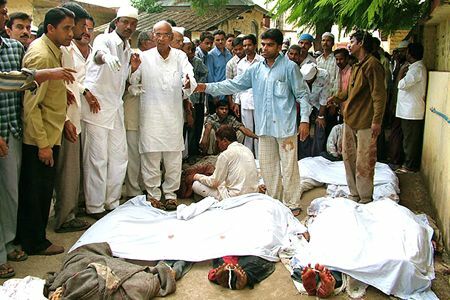 She noted that with six Americans killed in the attacks, the U.S. was cooperating closely with India. Rice's visit was a part of U.S. effort to defuse tensions in the region and pressure Pakistan to share more intelligence and root out suspected terrorists believed hiding in the country. Many Indians wanted more than just harsh words. 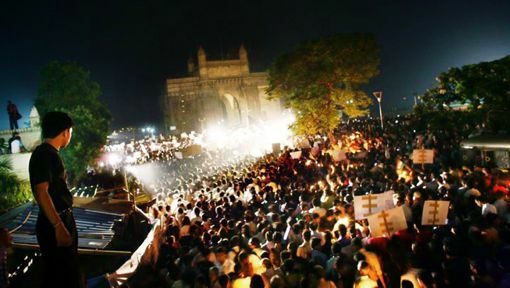 At the candlelight gathering in Mumbai, many called for war. "India should attack Pakistan right away," said Sandeep Ambili, 27, who works for a shipping company. "Something has to be done. 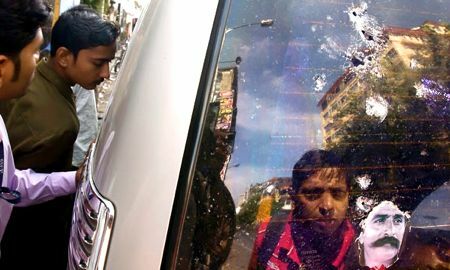 Pakistan has been attacking my country for a long time," said another protester, Rajat Sehgal. "If it means me going to war, I don't mind." Others chanted anti-Pakistan slogans and held banners reading: "Enough is enough, go for war." 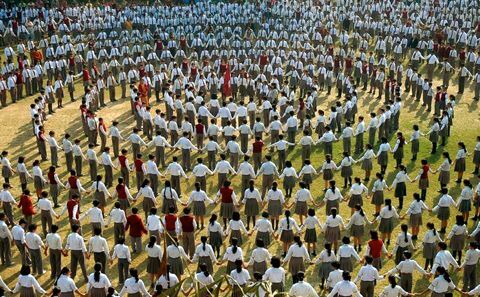 Similar rallies were held in cities across India. 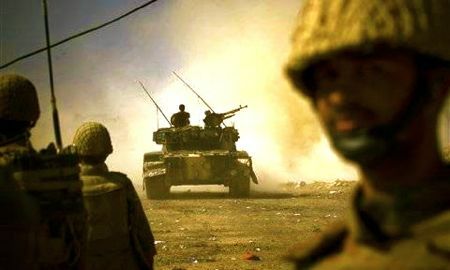 After a 2001 militant attack on India's parliament, also blamed on elements in Pakistan, the two neighbors posted nearly 1 million soldiers along their border in a yearlong standoff. 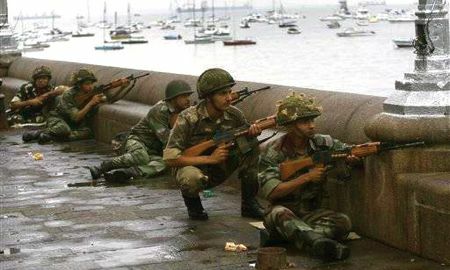 The two nations have fought three wars since independence from Britain in 1947, but neither government wants a fourth. Both now have nuclear weapons. India has called on Pakistan to turn over 20 people who are "fugitives of Indian law" and wanted for questioning, but Pakistani President Asif Ali Zardari said the suspects would be tried in Pakistan if there is evidence of wrongdoing. 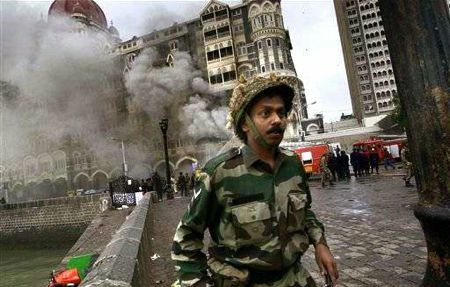 Much of the evidence that Pakistanis were behind the Mumbai attack comes from the interrogation of the surviving gunman, who told police that he and the other nine attackers had trained for months in camps in Pakistan operated by the banned militant group Lashkar-e-Taiba. 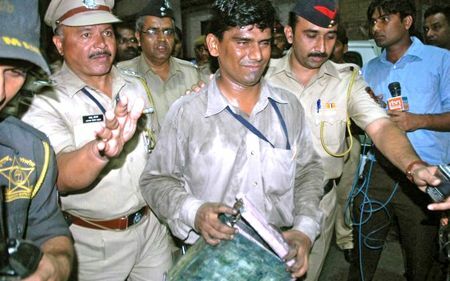 Ajmal Amir Kasab, 21, told investigators his recruiters promised to pay his family from an impoverished village Pakistan's Punjab region $1,250 when he became a martyr. Kasab said he and the other gunmen were "hand-picked" for the mission and trained for more than a year by Lashkar-e-Taiba, based in Kashmir, according to two senior officials involved in the investigation. They spoke on condition of anonymity because they were not authorized to talk to media about the investigation. 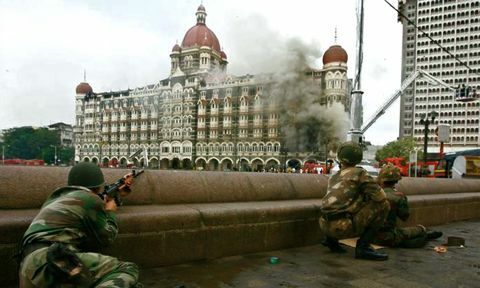 MUMBAI, India — India suspects that two senior leaders of a banned Pakistani militant group masterminded last week's three-day terrorist attacks that killed 171 people in Mumbai, an Indian intelligence official said Thursday. 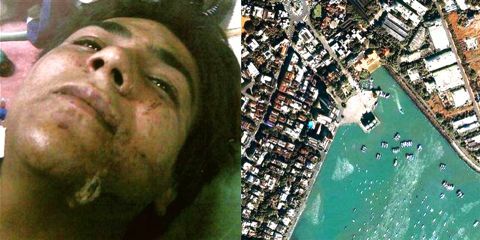 Evidences collected in the investigation of the deadly siege point to Zaki-ur-Rehman Lakhvi and Yusuf Muzammil, the official said, speaking on condition of anonymity because he wasn't authorized to speak publicly about the details. 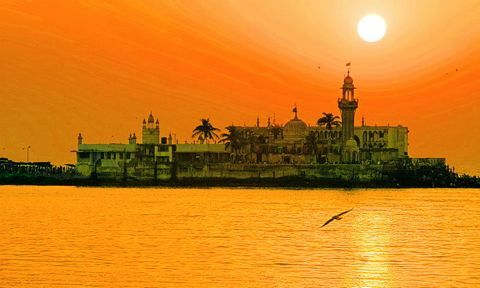 Lakhvi and Muzammil are believed to be top members of the outlawed Pakistani group Lashkar-e-Taiba, which India blames in the attacks. Muzammil is the group's chief of operations in Kashmir and other parts of India and Lakhvi its chief of operations, authorities said. 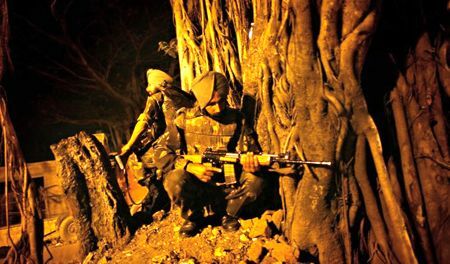 The two suspects are believed to be in Pakistan, the Indian intelligence official said. From U.S., Secretary of State Condoleezza Rice arrived in Pakistan on Thursday for meetings with civilian and military leaders after visiting Indian leaders in New Delhi. She aimed to raise pressure on Pakistan's government to help get to the bottom of the terror attacks. The U.S. wants Pakistan to do more to go after terror cells rooted in Pakistan. From the Pentagon, Joint Chiefs of Staff Chairman Mike Mullen was pushing the same message in Pakistan on Wednesday, and also was to meet with officials in India during his trip. 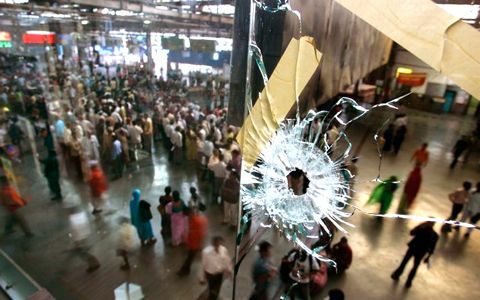 Meanwhile, police found two bombs at Mumbai's main train station nearly a week after they were left there by gunmen behind the attacks — a stunning new example of the botched security that has sparked outrage in India since the deadly three-day siege. 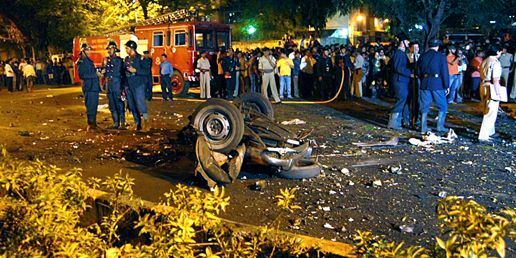 The discovery Wednesday came as Foreign Minister Pranab Mukherjee said India is "determined to act decisively" following the attacks, saying the evidence was clear the gunmen came from Pakistan and their handlers are still there. 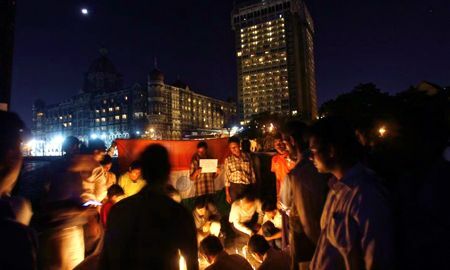 His words, the strongest yet from the government, came as thousands of Indians — many calling for war with Pakistan — held a vigil in Mumbai to mark one week since the start of the rampage. 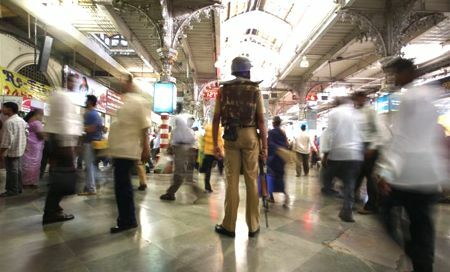 While searching through a mound of about 150 bags, which police believed were left by the dozens of victims in the Chhatrapati Shivaji Terminus station, an officer found a suspicious-looking bag and called the bomb squad, said Assistant Commissioner of Police Bapu Domre. Inside were two 8.8-pound (4-kilogram) bombs, which were taken away and safely detonated, he said. After the attacks, police found unexploded bombs at several of the sites, including two luxury hotels and a Jewish center. It was not immediately clear why the bags at the station were not examined earlier. The station, which serves hundreds of thousands of commuters, was declared safe and reopened hours after the attack. 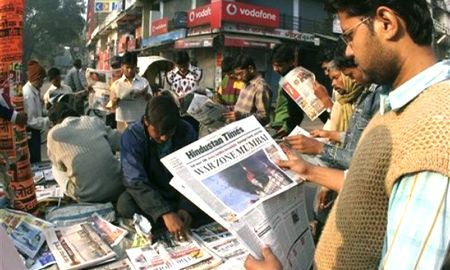 The discovery has added to increasing accusations that India's security forces missed warnings and bungled its response to the Nov. 26-29 attacks. 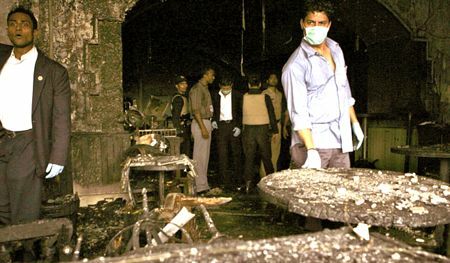 Indian navy chief Sureesh Mehta has called the response to the attacks "a systemic failure." 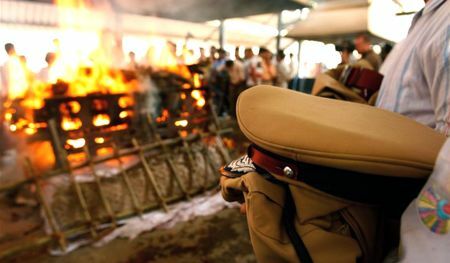 The country's top law enforcement official has resigned amid criticism that the 10 gunmen appeared better coordinated and better armed than police in Mumbai. 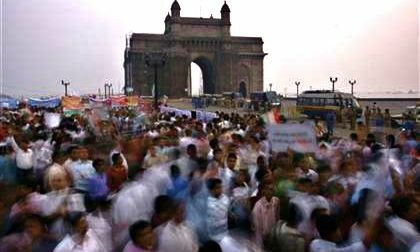 Continued from the previous issue — The State Department issued at least two terrorism-related warnings to Americans in India in October, including one specifically covering western India, which includes Mumbai. These warnings are usually issued after threat information is received, but are less specific than what intelligence agencies would pass on to their counterparts. 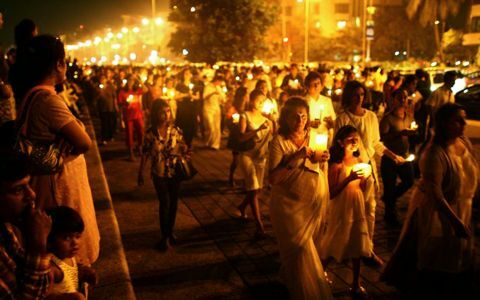 They highlighted the holiday season in India and the potential for large crowds in shopping areas, restaurants and train stations, which are frequently targeted by terrorists. The warnings did not specifically mention hotels. 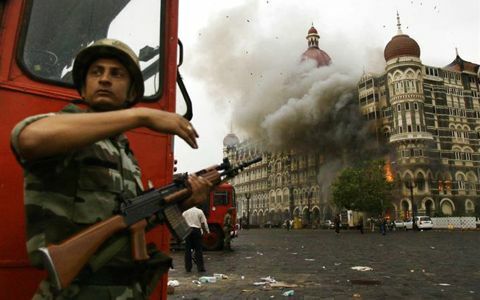 U.S. counterterrorism officials said the Mumbai attack was similar to past operations undertaken by groups such as Lashkar-e-Tayyiba and Jaish-e-Mohammed. 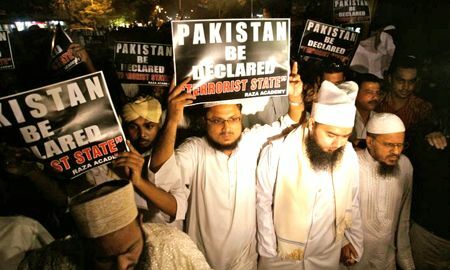 Lashkar, a terrorist group based in the disputed Kashmir region, was banned in Pakistan in 2002 under pressure from the U.S., a year after Washington and Britain listed it a terrorist group. 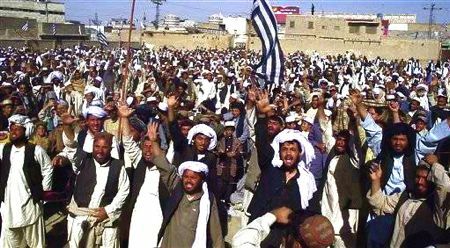 It is since believed to have emerged under another name, Jamaat-ud-Dawa, though that group has denied links to the Mumbai attack. The State Department includes Lashkar on its foreign terrorist organizations list, one of three in Kashmir. 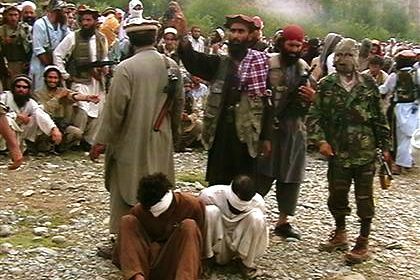 Lashkar has attracted Pakistani members as well as Afghan and Arab veterans who fought the 1980s Soviet occupation of nearby Afghanistan. 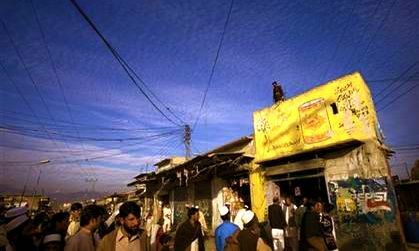 It has been active in Kashmir since 1993 but extended its operations into Afghanistan after the Sept. 11 terrorist attacks and U.S.-led war in Afghanistan, a second U.S. counterterrorism official said. 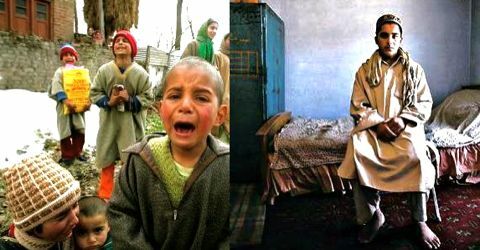 "One thing people are looking at is the real possibility of a Kashmiri connection. 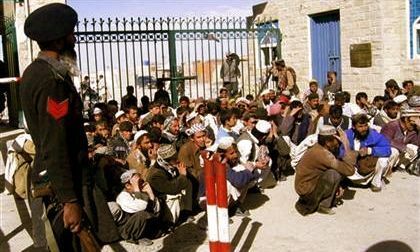 Some of what's been learned so far points in that direction," a second U.S. counterterrorism official said. 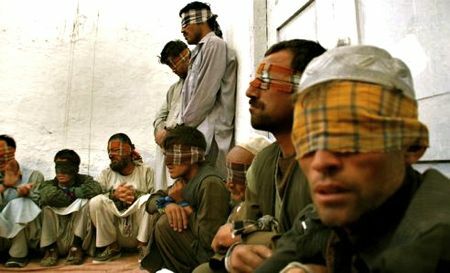 Amid some information that the terrorists trained in camps in Pakistan, India has demanded that Islamabad hand over suspected terrorists believed living there and had said that Pakistan's leaders must take "strong action" action against those responsible. 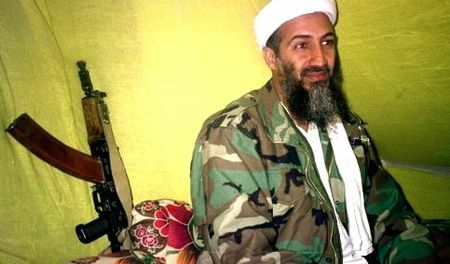 On the origins of the terrorists, the official did not detail the evidence leading to a connection in Pakistan, and did not single out any one terror organization as suspect. But the official said "a variety of information, some of it public, some of it not" points to an unspecified terror group "partially or wholly ... located on Pakistan's territory." 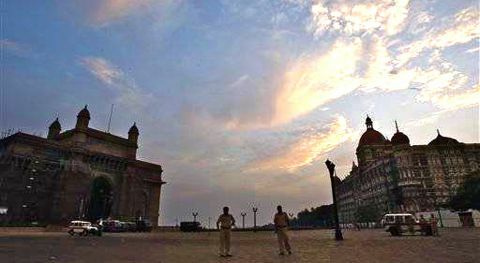 WASHINGTON — Evidence suggests that a group partly based in Pakistan carried out last week's attack in India, U.S. officials said Tuesday, also revealing that the U.S. had warned the Indian government beforehand that terrorists appeared to be plotting an assault on Mumbai. 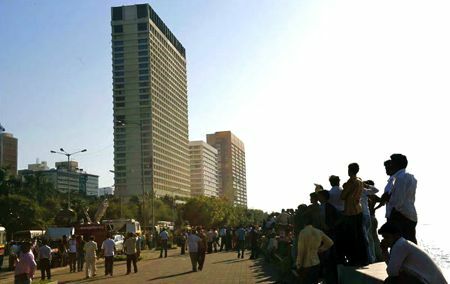 The brutal, prolonged attack on India's financial capital has some roots in Pakistan, a senior State Department official said. That's the closest the U.S. has come to placing blame for the coordinated assaults, although the official was careful to say that not all the evidence is in. The official spoke on condition of anonymity because the investigation is ongoing. 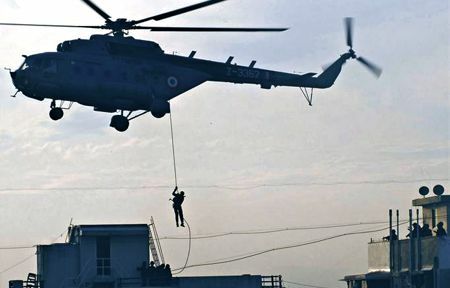 Indian authorities have claimed a Pakistan connection for days, but the United States has not wanted to "jump to conclusions," as Secretary of State Condoleezza Rice said Monday. 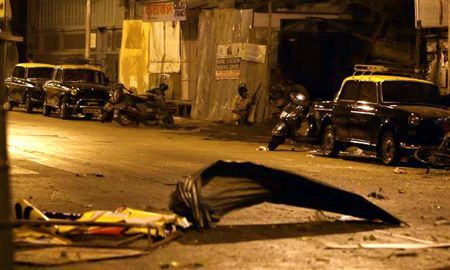 The administration fears that any misstep amid the extraordinarily high emotions surrounding the three-day assault killed 172 and wounded 239 in the heart of Mumbai. It could spark new and possibly deadly tensions between nuclear-armed rivals India and Pakistan. U.S. Defense Secretary Robert Gates told a Pentagon news conference Tuesday that the chairman of the Joint Chiefs of Staff, Adm. Mike Mullen, had gone to the region to meet with officials. Rice also is to visit India on Wednesday, carrying the U.S. demand that Pakistan cooperate fully in the investigation into the attack. 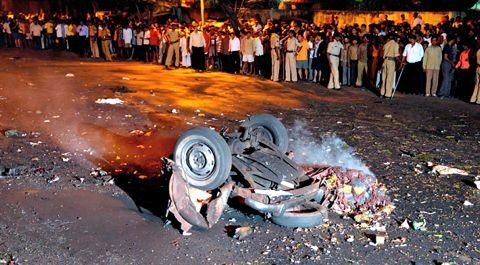 Among those killed in Mumbai were six Americans. 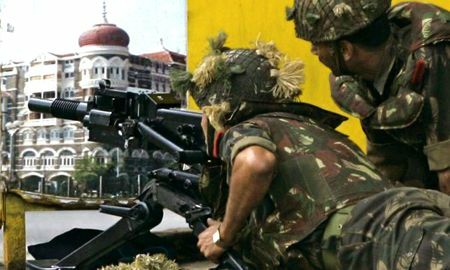 The revelation of a U.S. warning to Indian counterparts about a possible coming attack comes as the Indian government faces widespread accusations of security and intelligence failures in the wake of the assault. 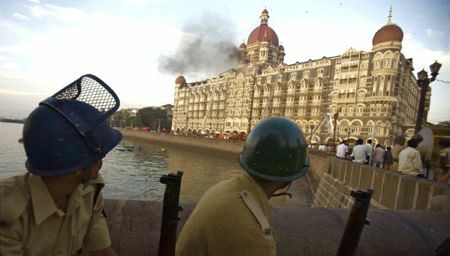 Washington passed on information it had that a waterborne attack on Mumbai appeared in the works, said a senior administration official, speaking on condition of anonymity because of the sensitive nature of intelligence information. The official would not elaborate on either the timing or details of the U.S. warning. 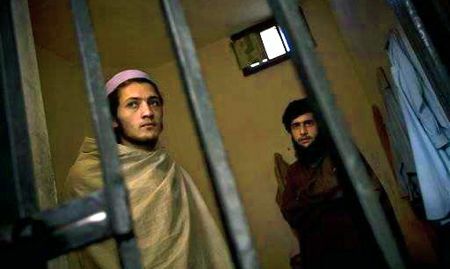 NBC News reported Tuesday that a confidential U.S. intelligence analysis concludes that some of the Mumbai terrorists were likely trained by the Lashkar-e-Tayyiba terrorist group, with "camps located in Mansera and Muzzarafabad in Pakistani-administered Kashmir." 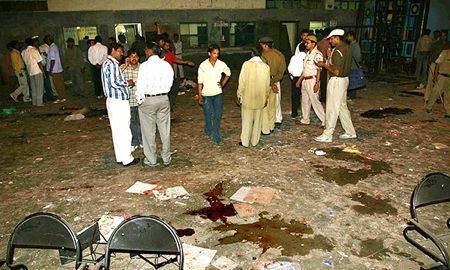 The 10 terrorists behind the Mumbai massacre "spoke Punjabi" and were of "likely Pakistani origin," the report said. The 17-page report was written by the Overseas Security Advisory Council, a public-private group that serves as a liaison between the State Department and multinational corporations, NBC said. 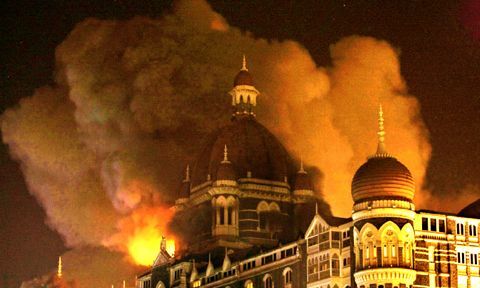 NBC also reported that Indian authorities have found the names of several high-ranking members of Lashkar — including Yusuf Muzammil, head of Lashkar's operations unit — in the satellite phone used by one of the Mumbai attackers. 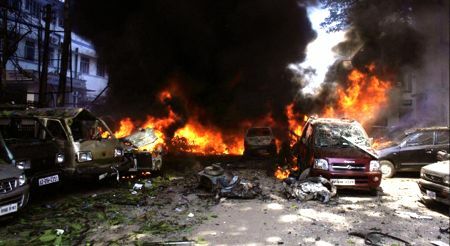 There's evidence that calls were placed to some of the Lashkar leaders from the satellite phone, NBC reported. 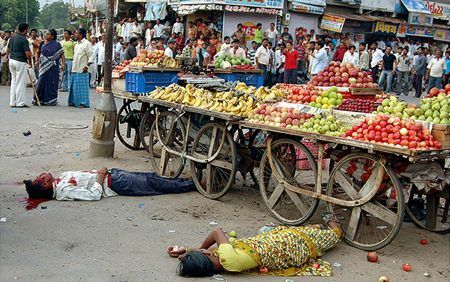 Neither Gates nor Rice would confirm that the United States had passed specific information to India ahead of the attacks. "Obviously we try to pass information to countries all around the world if we pick up information," she said at a press conference at NATO headquarters in Brussels. 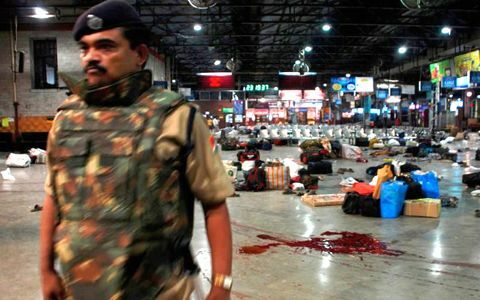 GAUHATI, India — A bomb exploded in a train coach in India's insurgency-hit northeast on Tuesday, killing at least three people and injuring another 29, a state government official said. 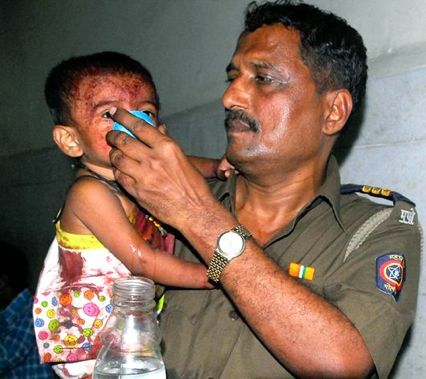 The explosion occurred shortly after the train arrived at Diphu railroad station, about 200 miles (300 kilometers) south of Gauhati, the capital of Assam state, said District Magistrate M.C. 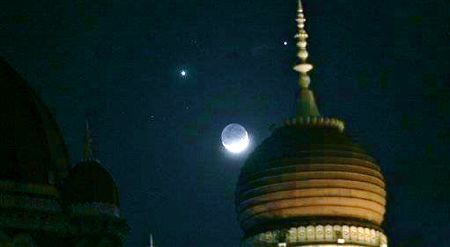 Sahu. The train was heading from Lumding in central Assam to the eastern commercial hub of Tinsukhia, Sahu said. 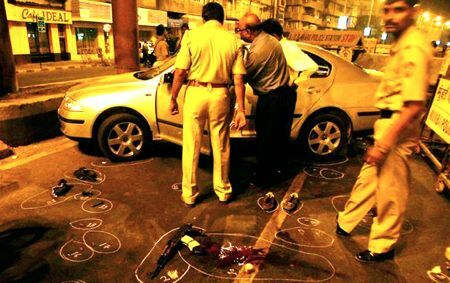 Tuesday's blast comes just days after suspected Muslim militants attacked targets across Mumbai, killing at least 172 people and injuring 239. 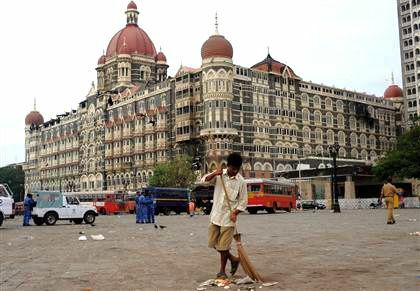 Tuesday's blast was not seen as related to the Mumbai attacks. 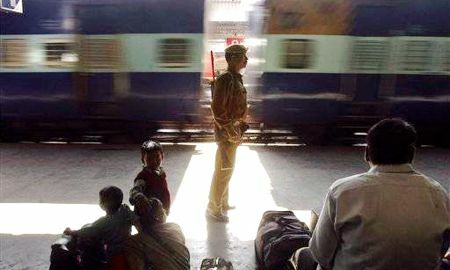 Two train passengers were killed on the spot and one of the 30 wounded later died in a hospital, said Bhaskar Mahanta, a police official. Two of the wounded were in critical condition. The bomb was a timed device, left in a bag on an overhead rack of the train coach and it blew off a part of the roof, said another police official, K.K. Sharma. 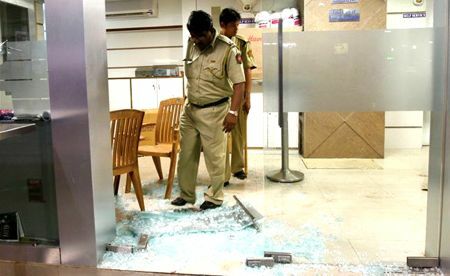 While no one immediately claimed responsibility for the attack, Sharma said an ethnic insurgent group, Karbi Longri National Liberation Front, fighting for wide autonomy in the state for the past five years, was suspected. The front is one of the three groups active in the region; the other two groups have reached cease-fire accords with the government. Separately, suspected insurgents shot and killed two migrant workers in the same district on Tuesday, Mahanta told The Associated Press. The two petty traders from northern India were pulled out from their homes in Dolamara, a village, and fatally shot, he said, blaming the same insurgent group, Karbi Longri National Liberation Front. 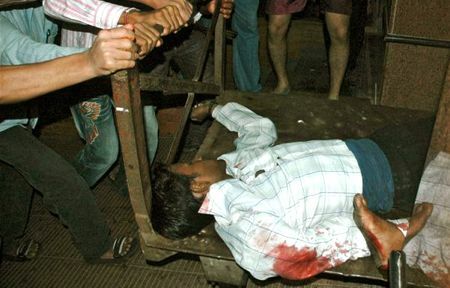 Suspected separatists have killed nearly 300 migrants over the past three years in Assam state. 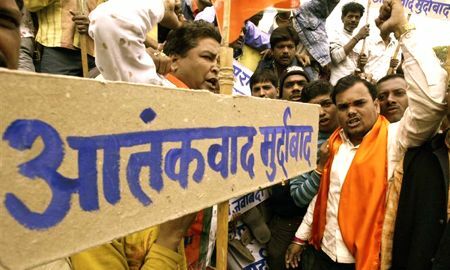 They have been targeting thousands of Hindi-speaking migrants from northern states like Bihar and Uttar Pradesh who they claim usurp the local population's job opportunities. In October, the state witnessed 13 coordinated bomb attacks, which killed 89 people and wounded more than 800 in four towns. 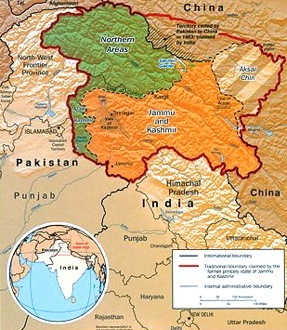 Several insurgents groups are battling for power, for ethnic pride and for control of drug routes in India's northeast, an isolated collection of seven states and hundreds of ethnic groups and subgroups. They fight the government and they fight each other in a region crippled by poverty and political chaos. 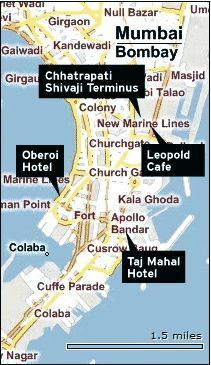 MUMBAI, India — A 60-hour terror rampage that killed 196 people across India's financial capital ended Saturday when commandos killed the last three gunmen inside a luxury hotel while it was engulfed in flames. 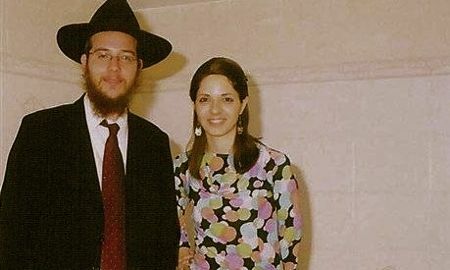 Authorities searched for any remaining captives hiding in their rooms and began to shift their focus to who was behind the attacks, which killed 18 foreigners including six Americans. 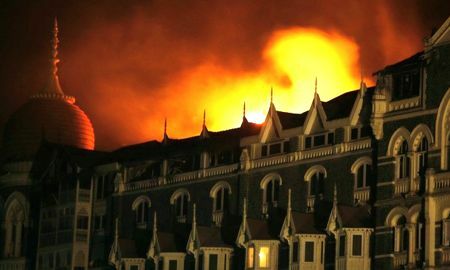 Orange flames and black smoke engulfed the landmark 565-room Taj Mahal hotel after dawn Saturday as Indian forces ended the siege in a hail of gunfire, just hours after elite commandos stormed a Jewish center and found six hostages dead. 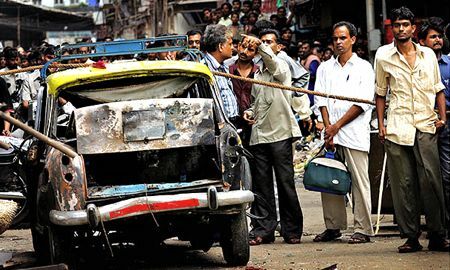 Nine of the attackers were killed, a tenth caught alive. 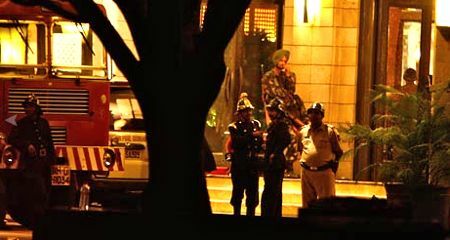 He told interrogators they wanted to go down in history for an "Indian 9/11", and were also inspired by the bombing of the Marriott hotel in Islamabad in September, Times Now TV said, quoting an unidentified defense ministry official. 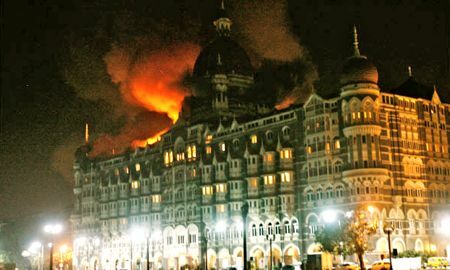 Local news channel NDTV also reported the captured militant told investigators the gang aimed to blow up the Taj hotel and hoped to kill a total of 5,000 people. It is thought that the terrorists underestimated the strength of the building's stone exterior. 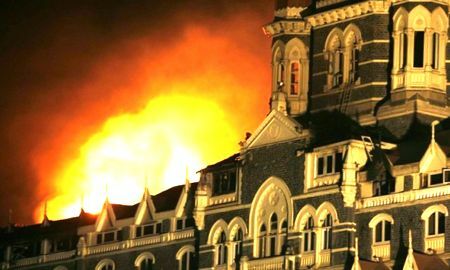 Explosions continued rock the Taj hotel after the battle as soldiers blasted open doors and detonated explosives found on the gunmen as they swept the hotel once more looking for survivors and booby traps left by the militants. 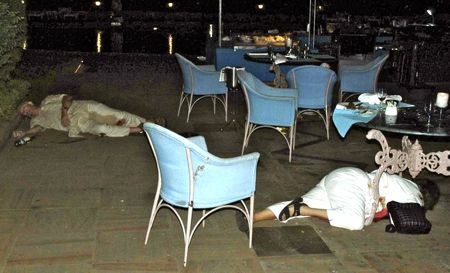 Some hotel guests were still believed to be in their rooms. 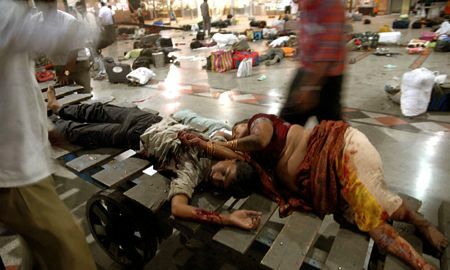 "The blood, everywhere the blood," an American woman called Patricia told NDTV channel, choking back tears. "And when we came down to the lobby, all the hundreds and hundreds of policemen were standing there looking so fried and so sad." 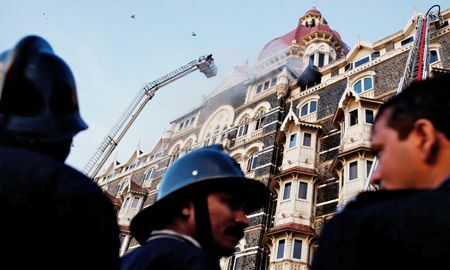 Several newspapers said some of the militants had checked into the Taj hotel days or weeks before the attacks, while the Times of India said they had rented an apartment in the city a few months ago pretending to be students. 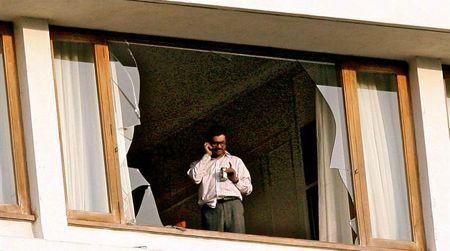 An army general said the gunmen appeared to be very familiar with the hotel's layout and were well trained. 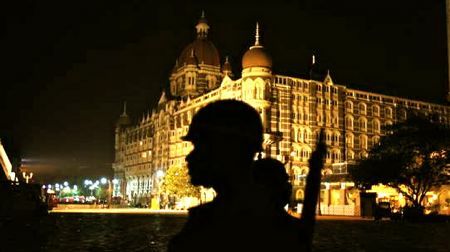 "At times we found them matching us in combat and movement," one commando told the Hindustan Times. "They were either army regulars or have done a long stint of commando training."